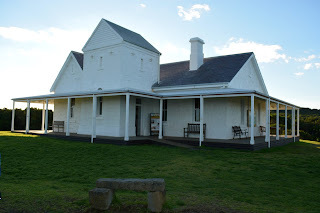 There is so much to explore along the Great Ocean Road that it can sometimes be overwhelming as to where to start. I wouldn't recommend trying to see everything in one day. It's impossible, you're going to rush, and you're going to miss out on a lot. One could probably spend a good week exploring the Great Ocean Road and still not be able to fully appreciate it. 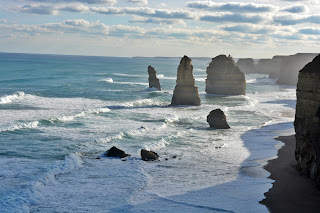 Luckily, I live in Melbourne which is almost a stone's throw away from the Great Ocean Road. There's no need to rush a trip! 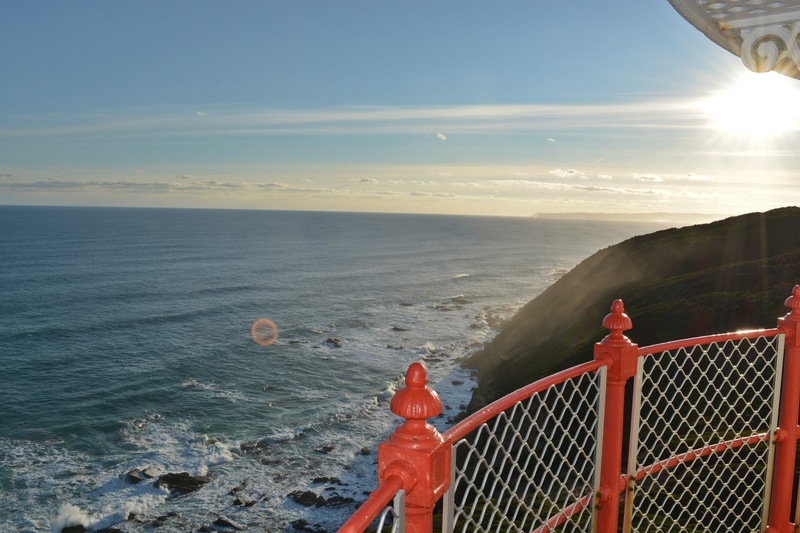 Depending on where along the Great Ocean Road your visit, it is roughly an hour and a half to 3 1/2 hours away from Melbourne. But where do you begin? 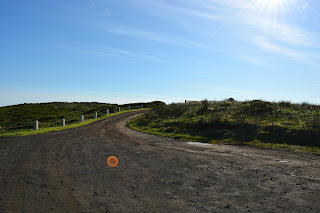 My most recent trip along the Great Ocean Road was not my first. I've gone roughly a dozen times as Bell's Beach and Torquay Surf Beach are some of my favourite beaches to go surfing at. I absolutely love exploring here. Every time I visit (even if it's a place I've seen before), I'm always experiencing new things. 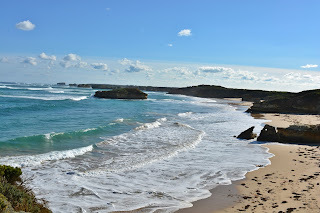 A friend suggested taking a day trip to see the Bay of Islands, so we jumped in the car and drove to the far end of the Great Ocean Road. First, a word of caution. 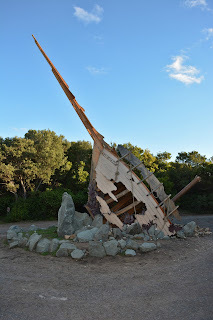 Do NOT type Bay of Islands Coastal Park into Google Maps on your phone. If it's not trying to send you to New Zealand, the directions will end up taking you down this long dirt road that leads to nowhere. Although you will get a fabulous view of the ocean, you will have no view of the Bay of Islands. The road is filled with crazy potholes so if you have a little car (such as myself) do yourself a favour and just turn around! I have a feeling the locals are used to people getting lost down this road as we got a few smiles and chuckles driving back. You're better off just getting directions to Peterborough and following the signs. I'm euphoric we didn't give up after our 'slight' detour. 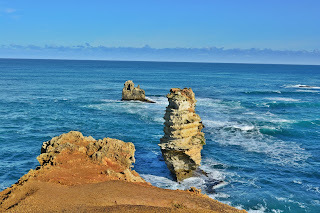 I thought the 12 Apostles were impressive, but the Bay of Islands blows them out of the water. It's so breathtakingly beautiful! Plus you don't have to deal with the busloads of tourists. It's a bit quieter which makes the experience that much more incredible. There are two different lookout points: The Bay of Islands and The Bay of Martyrs. Both provide spectacular views of the amazing scenery. At the Bay of Martyrs, you're also allowed beach access (ocean tide permitting). Sadly, the beach access was closed when I visited, but I still got some fantastic views! 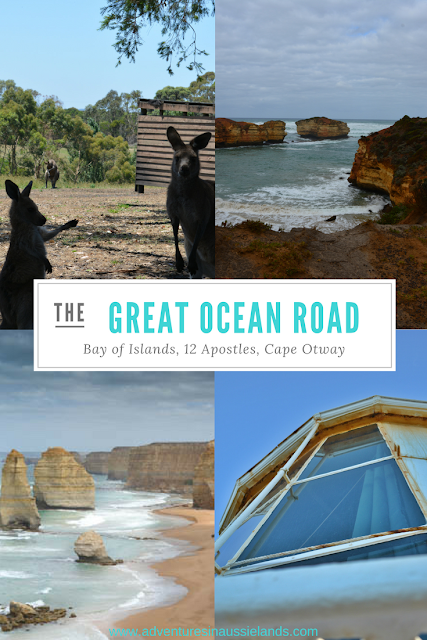 Just a short drive south from the Bay of Islands is the 12 Apostles and Gibson Steps. 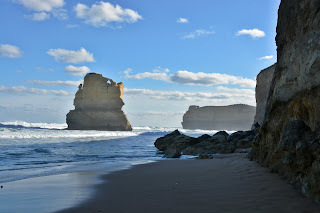 Like the Bay of Islands, the 12 Apostles is a collection of limestone stacks created by erosion from the ocean. Not all 12 apostles currently stand. I believe only 4 are left standing. When visiting, be prepared for heaps and heaps of people. Even during the winter, there are always busloads of people. If you want a truly spectacular view of just how large these limestone stacks are, take a walk from the car park to Gibson Steps. It's about a 20-minute walk to get to the steps but well worth it! Make sure you're there during low tide as the steps close during high tide. Prepare to feel incredibly small as you walk along the beach admiring these natural beauties! After finishing up at 12 Apostles, we hopped back into the car and drove down to Cape Otway Lighthouse. From the 12 Apostles, it is about an hour and a half drive. There are other points of interest along the way, but we decided not to stop. Mainly, we wanted to see koalas in the wild. Guess what?! We found some!! 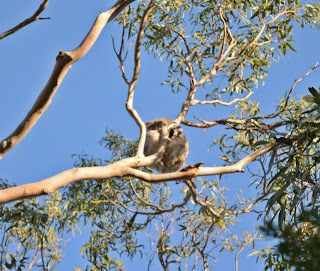 After pulling the car over to the side of the road to see what people were pointing at, we found a whole heap of koalas sitting in a tree. 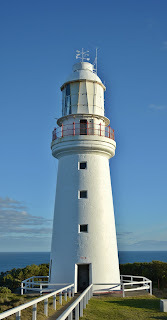 After our success with the koalas, we made our way to the lighthouse. I was under the impression that the lighthouse was free. However, there is a small fee for entry. Normally it is $12, but as we got there quite late, we received a bit of a discount (thank you to whoever was working that day!). At first, I found it strange that there was a fee to enter but quickly changed my outlook when I saw how much there was to do upon entry. 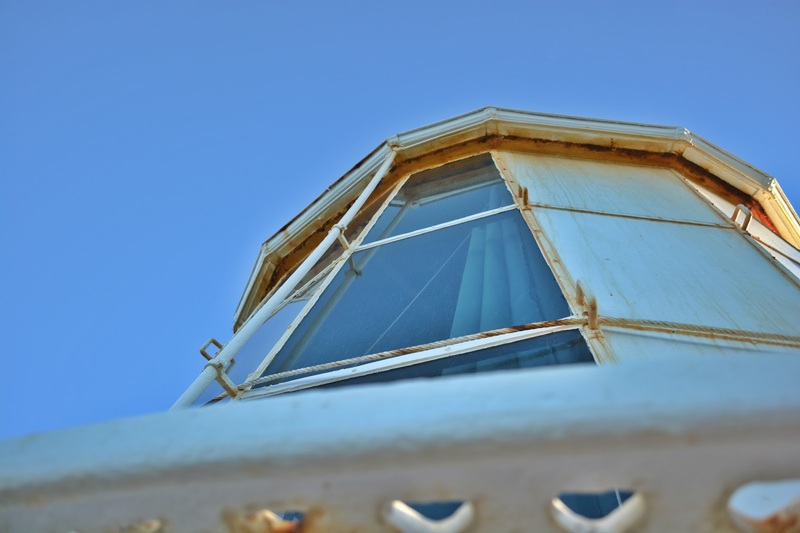 Not only do you get to go inside the lighthouse but there is a cafe, different living quarters to explore, information about Aboriginal culture, and character actors that make the experience way more fun! 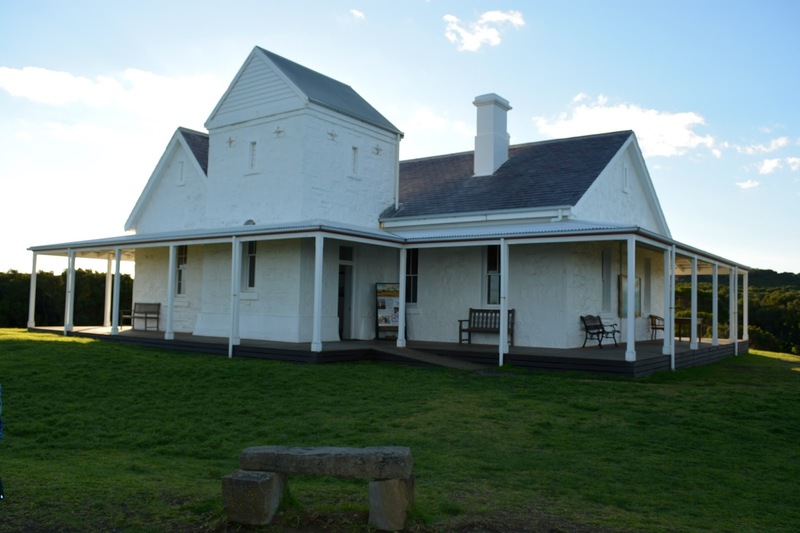 Looking for other adventures around Melbourne? Hi Stephanie, I found you through Instagram while search for #greatoceanroad pics. We're heading there this weekend and it looks amazing! That's awesome! Hopefully the post gave you some ideas of what to see on the Great Ocean Road and that you had a fantastic trip! It's always nice to catch up with other Americans. Nice to hear a familiar accent every once and a while!